The UNLV women’s tennis team stayed perfect in Mountain West play with a 6-1 victory over San Jose State on Sunday at the Fertitta Tennis Complex. 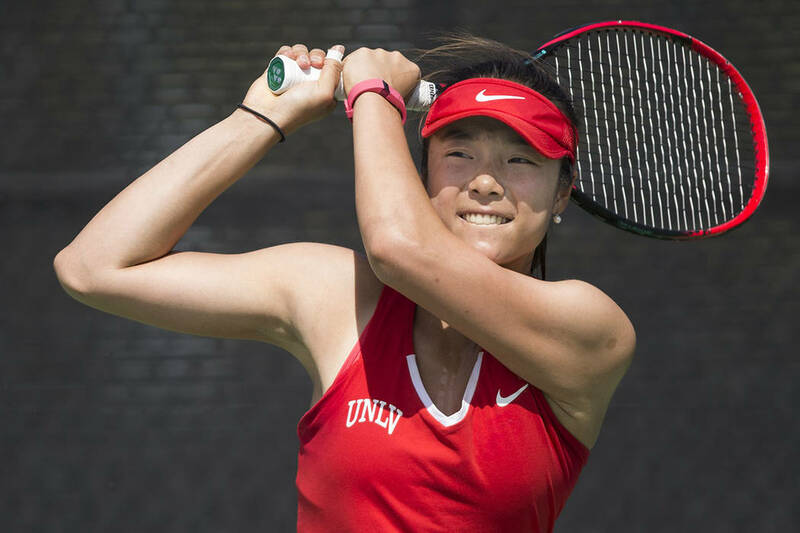 Aiwen Zhu, Izumi Asano, En-Pei Huang, Anna Bogoslavets and Jovana Kenic won their singles matches, and the UNLV women’s tennis team stayed perfect in Mountain West play with a 6-1 victory over San Jose State on Sunday at the Fertitta Tennis Complex. Bogoslavets also teamed with Juliet Zhang to get the clinching doubles point for the Rebels (11-5, 3-0) against the Spartans (10-6, 0-1). The Rebels next host Montana on Thursday in their final home match of the season. At Boise, Idaho, Alexandr Cozbinov, Courtney Lock, Eric Samuelsson and Jordan Sauer won their singles matches, and the Rebels defeated Boise State for the first time in Mountain West play, 4-1. UNLV (11-7, 1-2) rallied after losing the doubles point, snapping a five-match home win streak for the Broncos (8-11, 1-2). The Rebels next host Air Force on Friday.